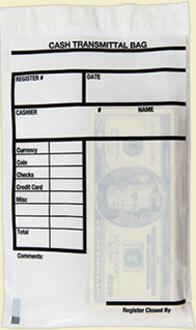 Our 6″ x 9″ secure cash transmittal bags are designed for transferring cash from register to money room or closing out a cash drawer at the end of a shift. Ample writable space and fields on the face of the bag allows you to write the appropriate information and documentation. You may then insert cash and valuables, seal the bag with PolyPak’s SureSafe™ closure, and place or send the bag to the appropriate destination.